French President Francois Hollande maneuvered from outright confrontation over Syria to emphasising bilateral relations and trade issues on his first official trip to Moscow Thursday, where he met with his Russian counterpart Vladimir Putin. “I am here and this testifies to the quality of our relations. These are historic relations which unite our two nations. As two large countries we have close relations, and as members of the UN Security Council we have a responsibility concerning international conflicts and to prevent threats, particularly of terrorism,” Hollande said. France is the greatest European supporter of the Syrian rebels hoping to unseat President Bashar Al-Assad; Russia is the Syrian president’s greatest backer. “We have the same objective – to avoid disintegration of this country and to avoid allowing terrorists to profit from this chaos. We want political dialogue,” Hollande said, after his first trip to Russia as president. Hollande praised Putin for facilitating contacts between the Syrian opposition and the government, and expressed hope for a quick solution to the confrontations. “It seemed to me this issue (Syria) can’t be resolved immediately without a bottle of vodka, let alone a bottle of good wine. 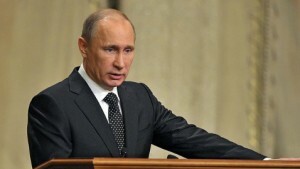 We will have to sit and think,” Putin told reporters. In response, Hollande said it would be better to do it “over a bottle of port.” The joke caused much laughter from reporters. The French President then focused on economic diplomacy hoping to convince Putin to invest in French markets. France has been looking to stimulate recovery as a member of the hard-hit 17-member eurozone.